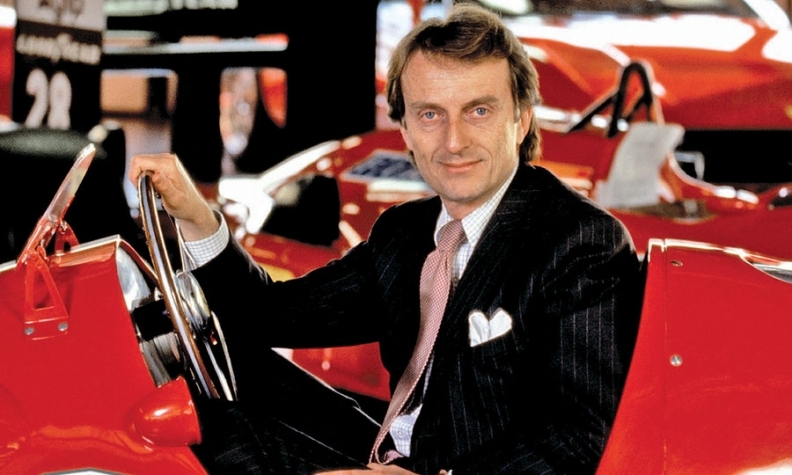 Luca di Montezemolo, shown when he became Ferrari CEO in 1991. MARANELLO, Italy -- On the morning of the day he celebrated 20 years as head of Ferrari, Luca Cordero di Montezemolo says his first thought was about the future, not the past. He pondered what the world's most famous sports-car maker would look like in 2020. "I have not come up with a comprehensive idea yet," said Montezemolo in an interview at his office in Maranello, 11 miles south of Modena in central Italy. One thing is already clear: The 64-year-old executive -- born in 1947, the same year Ferrari was established -- wants a better geographical distribution of sales, a third each in Europe, North America and the rest of the world. This year, North America will account for 27 percent of the expected 7,000 sales -- the company's best year ever -- with Europe at 45 percent and the rest of the world at 28 percent. Making Ferrari more international was one of Montezemolo's first decisions when he was appointed the company's CEO on Nov. 15, 1991. "At that time, the U.S., Germany and Italy combined for 90 percent of Ferrari sales, making the company too vulnerable if any of these three markets would have slumped," he says. Today, Ferrari sells its cars in 58 countries, twice as many as it did 20 years ago. During Montezemolo's tenure, Ferrari more than doubled global sales from 3,377 units in 1992, but he says he never diluted its exclusivity. "We doubled our global sales because we doubled the market we play into, not inflating sale volumes in areas where we were already a significant presence," he says. Montezemolo says maintaining the right level of exclusivity hasn't always been easy. Parent company Fiat S.p.A., which in 1969 bought 50 percent of Ferrari and in 1988 increased its stake to 90 percent (the remaining 10 percent is owned by Piero Ferrari, the son of company founder Enzo Ferrari), more than once pushed Montezemolo to boost production. "I resisted because it would have been a huge mistake," he says. "Luckily, Sergio [Fiat CEO Sergio Marchionne] shares my vision to defend, protect and nurture our exclusivity," he says. Montezemolo says Ferrari's limit is 10,000 units a year, but he is in no hurry to get there. "A customer should always wait a bit for a special car such as a Ferrari, and we think the current 12- to 16-month wait is the right level," he says. In the short term, production could increase a bit, using Saturday overtime if customer waiting lists get too long. Long term, Ferrari will wait for demand to grow steadily, and with a geographic balance, before permanently boosting production. Montezemolo attends a gathering in Germany of F40 models,CL1 launched in 1987 to celebrate the company's 40th anniversary. 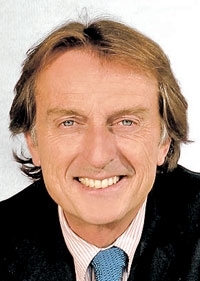 Montezemolo has lived through one sudden drop in demand and does not want to face another. After an initial stint as Ferrari's Formula One team manager from 1974-77, he returned to Ferrari as CEO in 1991. The company was in good shape. That year would close with a record 4,589 units built. But after a global economic decline, production halved to 2,325 units in 1993. "It was horrible," he says. To store unsold Testarossas, then the company's flagship model, Ferrari had to rent space at a nearby floor-tile manufacturer. Slowly, Montezemolo returned Ferrari to a production level of 4,500 units a year. But it took 11 years, until 2004. "When I got here [in 1991], Ferrari had a substantial product problem: just one vehicle architecture offered in two sizes," he says. The Testarossa was a two-seat, midrear-engine coupe with a 12-cylinder boxer engine. The smaller 348 had the same layout but with a V-8 engine. 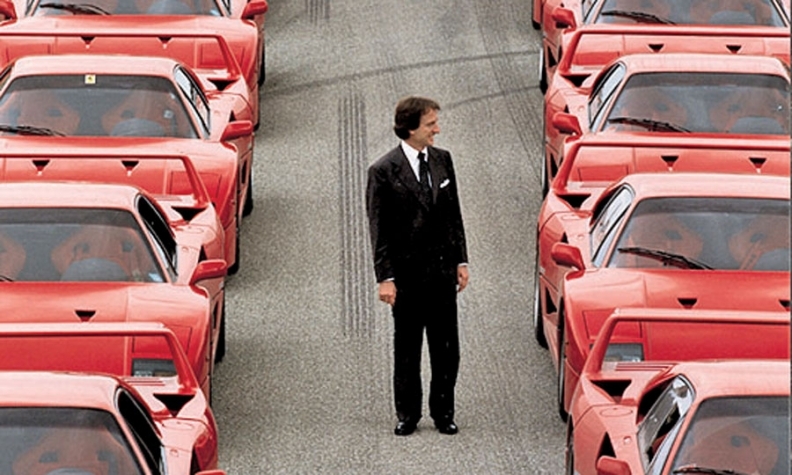 To make things worse, Montezemolo had just bought a 348 himself and was not a happy customer. He says the car lacked power, handling and refinement. He immediately ordered a complete redesign to address a long list of weaknesses. The 355 introduced in 1994 was a success. Since 1991, his mantra has been Ferrari diverse per Ferraristi diversi: different Ferraris for different Ferrari customers. But it took 20 years to fulfill his vision. 1. The 458, a two-seater with a midrear-mounted V-8 engine, offered as a coupe and roadster. 2. The California, Ferrari's first 2+2 convertible, with a front V-8 engine. 3. The 599 GTB, a two-seat coupe with a V-12 engine mounted in a central-front position between the front axle and passenger compartment. 4. The FF (for Ferrari Four), Ferrari's first four-seat coupe. It has a V-12 engine in a central-front position and is available with four-wheel drive. In Montezemolo's 20 years, Ferrari has built about 85,000 of the 140,000 units produced since Enzo Ferrari established the company. Another flaw Montezemolo found at Ferrari in 1991 was its outdated premises. "When I invited Ralph Lauren [a car collector and Ferrari fan] here in Maranello, he expected a high-tech place," Montezemolo says. "He was totally unimpressed with what I could show him." Montezemolo began revamping Ferrari's facilities, starting in 1997. But the renovation was another cause of friction between Montezemolo and Fiat. In Turin, Fiat's bosses weren't happy about spending money on projects that did not add clear value to the customer. The Formula One team was the fourth problem Montezemolo faced when he returned to Ferrari in 1991. "We had won the last drivers' world title 12 years before, in 1979, and the last manufacturer's title eight years before, and we were simply nowhere in terms of car, technology and people," he says. It would take a long while to return Ferrari to the top spot in Formula One. The first race victory came in 1994, the first manufacturer's championship in 1999 and the first drivers' championship in 2000. During Montezemolo's tenure as CEO, Ferrari won eight of the 16 total manufacturers' championships the company has won in its history and six drivers' titles of the 15 it has won. Montezemolo says Formula One has given him the most satisfaction, but also the toughest moments. "Losing a championship in the last race, like last year, is terrible," he says. "Losing in the very last lap of the last race, like with Massa in Brazil in 2008, wounds even more, believe me."